Which are the best compression socks in 2017? Great question! There are a lot of compression socks out there. Many of them are great, but some of them are, naturally, better than others. Nobody has the time or money to work their way through every compression sock on the market; that’s why we’re doing it for you! Unlike other reviews, we’ll go through a list of some of the products available in the market, tell you about a few of them and what you should look for in a compression sock. I’ll also quickly tell you how to care for your precious socks and then, at the end, tell you what I think about which are best compression socks on the market. All of the products listed link to Amazon.com. These socks are really top of the line, and their price shows it. They feature graduated compression (compression that begins at the ankle gradually eases as you get further away), medical grade leg support, and recovery and relief benefits if worn after a workout. At 20-30 mmHg, these socks offer great support to the wearer and can help prevent injuries like shin splints and more. In fact, these are some of the best running compression socks. People with diabetes, edema and varicose veins should also look into this sock. They can be worn day or night to relieve various symptoms of medical conditions. Of course, they aren’t a cure for anything, so if you’re experiencing any pain be sure to contact a doctor. Then on the other side of things, we find these socks by Copper Dress. The first thing that jumps out at you about these things is how inexpensive they are. They come in a pack of three pairs. Considering that some compression socks can cost much, this is a pretty great deal. On the other hand, these socks are obviously not for athletic wear. If you’re looking for something to run in, these probably aren’t the product for you–unless you do most of your running in a suit, which would be cool. McNick says this sock is antibacterial and odor free, which they attribute to its copper fabric’s sterilization properties. They also claim that the copper infusion makes these socks superior for blood circulation, detox, metabolism stabilization, inflammation reduction and more. Personally, I’m not sure how much validity there is to such claims, but this isn’t the first compression sock company to laud the healing properties of copper, so maybe there’s something to it. Lastly, these socks are not very flashy at all. They come in two understated colors–black and beige. Again, this isn’t really a product for flashy athletic-types. But if you’re going on a business trip and want to avoid discomfort on a long flight, they’re a good choice. 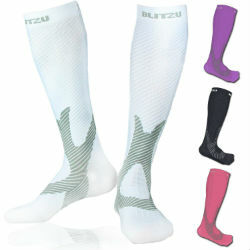 2XU is one of the industry’s leading manufacturers of compression gear. They can be a little expensive, but hey, that’s the price you pay for the best gear around, and these are certainly some of the best compression socks for runners. Speaking of which, these socks are designed specifically for women who are serious about playing sports. They come with added support for your ankles and Achilles area. Like many compression socks, they promote circulation and oxygen uptake. They’re perfect for hiking, running, walking or any other outdoor activities. Indoor sports like basketball and track aren’t out of the question either! 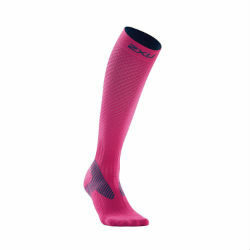 2XU’s sock is designed to keep your calf muscles in place while you run, preventing muscle oscillation and thus stopping you from getting sore (or at least reducing your post-workout soreness levels). Have sweaty feet? Not a problem with these socks. Their anatomical modeling manages the moisture your feet produce and allows you to wear them drier and longer, meaning that your workouts don’t have to be cut short or made uncomfortable by sweating feet. The last sock in this review is the Mojo Recovery and Performance sports sock for women. While the 2XU sock before this was geared specifically to improving performance, Mojo’s design is more focused on helping you recover from a workout quickly. These stockings have a firm feel and stretch. They are on the thinner side, which is good for sports, but can sometimes lead to blistering, so be mindful. The tightness of the socks’ compression gradually increases up the leg, creating a pumping effect that delivers oxygen to your muscles during a workout. These socks have a medical grade compression level of 20 to 30 mmHg. Putting them on after a workout can help your muscles heal better and feel less sore the next day. Wearing them the day after working out is similar in effect to elevating your legs. Comfort is also a strong suit of these socks. Certain zones of the sock have greater cushioning to stop your feet from getting irritated by your shoes during a workout. The socks’ flat seams further aim to ward off blistering and abrasions. What are important features of a compression sock? Which compression sock you want to go with is going to depend on what you plan to use it for. This is going to be different for everybody, and in truth, I can’t tell you what should be most important for you. But here are three things I think you should consider before making a purchase. Is it for athletic or medical purposes, or something else? This being a general compression socks review, there are also compression socks for travel or fashion and some that are geared more to athletics. Which are you looking for? If you’re interested in buying the top compression socks or knee compression sleeve for running, you definitely want to make sure that the sock you’re buying comes with a reasonable degree of compression. Compression socks of strength 8-15 mmHg might not be enough, depending on how much support and blood flow stimulation you think you need. All of the socks listed here–men’s and women’s–are calf-length compression socks. If you’re strictly interested in athletics, you might also want to check out some ankle-high compression sock models. They don’t offer anything in the ways of ankle support, calf compression, or shin splint protection, but they can still be useful for athletes in need of some arch support. They also tend to be quite a bit less expensive! If, however, you’re looking into compression socks because you want to alleviate discomfort when you travel, or you are looking for compression socks for nurses and interested in the medical benefits of compression socks like relief from varicose veins, swelling, and edema, then you probably don’t care a lot about how much these socks will help your workout. Instead, you want something that is going to offer the right amount of compression to mollify your aches and pains–preferably without making you look like you belong in a nursing home. The best thing you can do for this is to pay attention to how much compression a given sock has to offer. You probably don’t want to go above 30 mmHg of compression without consulting a doctor, as high levels of compression could cause complications to someone with an existing condition. In the world of socks (if there is such a thing) breathability is paramount. Nobody likes walking around all day with the feeling that their shoes have turned into small, portable swamps. Sweaty feet can also contribute to athlete’s foot and blisters–nobody’s idea of a good time. In order to prevent such atrocities, you will need to find a compression sock that is made of a breathable material. Try to find socks that have at least some cotton, wool, or linen content if you can. 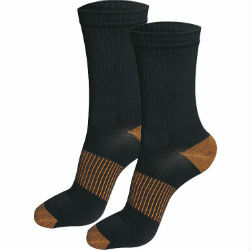 But make sure it’s not too much; cotton socks retain heat and moisture and will eventually give way to sweat. Many athletic socks are made from polyester because it stops feet from slipping around inside shoes and prevents blisters. Unfortunately, there’s a tradeoff to be had here: polyester is a synthetic material and does not “breathe,” so to speak. You find this a lot in compression socks, but there are brands out there that have high contents of natural fibers. If you’re someone whose feet get sweaty, you definitely want to pay attention to the fabric of the socks you’re wearing. These socks are supposed to make you more comfortable, after all! Lastly, some socks have various “cooling technologies” (they might call them something more clever) that promise to cool your feet by either wicking away sweat or ventilating. These could be alternative solutions to your sweat problem, so don’t fret if you can only find compression socks in synthetic blends. 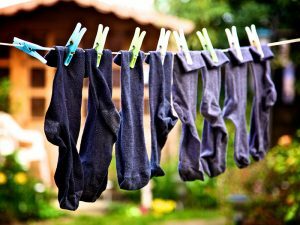 How to care for your compression socks? Compression socks (and compression gear in general) need to be cared for especially because their value is derived from the fact that they are functional pieces of clothing. Don’t worry; you don’t have to go crazy and hand wash everything, though some people will suggest you do that. Instead, following some light precautionary steps will ensure that your compression socks maintain their usefulness longer. First, always wash in warm water. Some sources will say to use cold water instead, and I don’t think there’s really a huge difference. The most important part, in my opinion, is that you don’t use hot water. Second, be sure that if you’re washing them in a machine, the machine is set to run on gentle. You don’t want to be too rough with these things! Lastly, and most importantly, avoid putting your compression socks in the dryer. Doing so can cause them to prematurely lose their elasticity, which would totally defeat the point of going out of your way to find the right compression socks! For women, the 2XU sock is the better of the two choices. While they may serve slightly different functions–performance versus recovery–the two socks are more or less similar. The 2XU sock is just in another league in terms of performance enhancement. If you’re looking to take your game to the next level, this is the sock to help you do it. Having said that, the Mojo sock is more on the cheaper side, so maybe it’s the better choice for a woman who’s not all that serious about sports. On the men’s side of things, I think it really depends on what you’re looking for. The McNick socks are cool and super cost effective. They won’t hold up too well in a sporting environment, so if you’re training, you absolutely want to go with the Blitzu model.